Everyone who works for us is a highly qualified, professionally trained holder of the English Heritage-approved Construction Skills Certification Scheme card. Many are following in the footsteps of their own parents, taking up heritage tools and skills to help us preserve some of our country’s finest listed buildings. 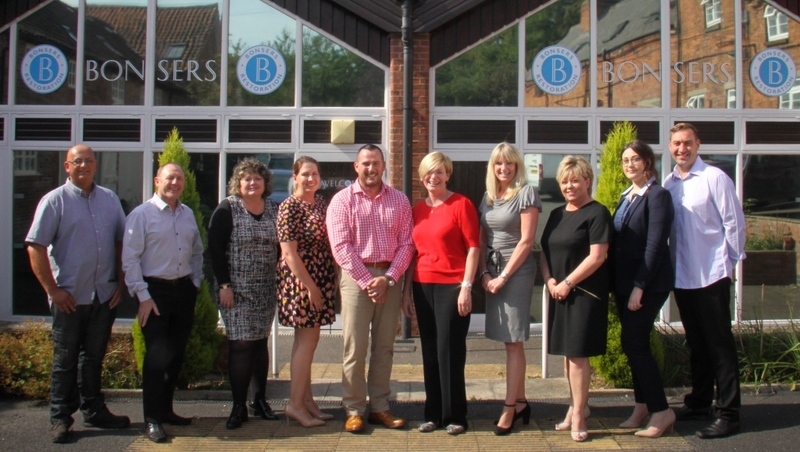 The Bonser's Team (left to right): Paul Dooley, Alan Haggerty, Ginette Bradbury, Amy Smith, Richard Hill, Jo Bonser, Vicky Combellack, Gail Haggerty, Remi Sturtivant and Wayne Sturman. Richard has over 27 years' of industry experience, is a qualified bricklayer and holds a Gold Heritage CSCS card together with Level 6 NVQ in Construction Site Management – Conservation. Bonsers' high standards of delivery and best conservation practices are continually met. As a third generation Bonser, Jo has been a part of the company since 1994 and has played a key part in the company's growth, helping to take it to the premier restoration company it currently is. Her drive and passion for our historic built environment is the cornerstone of our business ensuring the highest standards are maintained for both the buildings we are fortunate enough to work on and in her direct relationships with our clients. Vicky is also a third generation Bonser, and has been with the Company since 2004. As well as acting as Company Secretary, Vicky manages the accounts and fincance department. Vicky's role is key in ensuring the ongoing success of the company, and involves all aspects of accounts and financial management from project inception to completion. Alan joined Bonsers in 2013 and has over 20 years' knowledge of construction management processes, this knowledge has been developed by managing contacts from the conception through to the completion, with many of these being multi-million pound and multi trade projects and framework agreements. Alan's role within Bonsers is to schedule and coordinate our contracts and processes from the initial order to the completion handover, ensuring that they are completed on time, within budget and ensuring that our high standards of quality and delivery are maintained. Gail joined Bonsers in May 2015 and has over 9 years' experience of working in an office environment with over 20 years within a customer service enviroment. Gail's role at Bonsers is within our estimating department as the Estimating Co-ordinator, dealing with the day-to-day enquires. Gail is our clients' first port of call in the estimating process and she liaises with both the client and the estimator keeping them both up to date with the relevant informaion. Wayne has been part of the Bonsers team since 2009. He has over 20 years experience in the construction industry, with over 10 years in the conservation sector. Working up from the tools, Wayne progressed to site supervisor with Bonsers, before moving up to Construction Manager in 2016. Wayne's role involves overseeing site managers across all projects, co-ordinating labour, and responsibility for ensuring and maintaining Bonsers high standards of workmanship. Amy is also a third generation Bonser, and joined the team in June 2005. She is an efficient and capable administration manager, with excellent organisational and interpersonal skills. Amy is experienced in providing full secretarial, administrative and office management support to her colleagues and her role at Bonsers is overseeing that all administrative work is managed competently, and in accordance with the Company's changing priorities and deadlines. Paul has been part of the Bonsers team since 2012, he is a manager with extensive strategic project and operational management experience within the infrastructure and human resources sector. Paul possesses excellent interpersonal, communication and negotiation skills, the ability to influence decisions and to develop positive relationships both internally and externally. Paul enjoys being part of, as well as managing, motivating, training and developing, a successful and productive team and thrives in new and challenging working environments. Prior to joining Bonsers, Paul served with the Royal Engineers for over twenty years, with human resources and infrastructure experience in locations as diverse as the South Pole and the Middle East. Simon has over 25 years experience as a Quantity Surveyor within the construction industry, on maintenance, conservation, restoration, refurbishment and new build projects. He joined the Bonsers team in 2016. As a consultant QS for Bonsers, Simon deals with large scale commercial projects, providing surveying services from budget estimation, production of BQ's, contract adminsitration, and supply chain management including sub-contract procurement to final account agreement. Matthew joined Bonsers in 2017. He is a highly motivated quantity surveyor and commercial manager, who has been involved within the construction industry for over 20 years in varying roles from commercial management to project management, and has built up extensive experience in all aspects of the construction industry. Matthew is a highly organised and efficient individual, whose thorough and precise approach and good work ethic has resulted in the delivery of a number of successful projects for Bonsers.